A view of the newly named Sansha Yongle Blue Hole in Xisha Islands in Sansha City, South China’s Hainan Province, July 24, 2016. 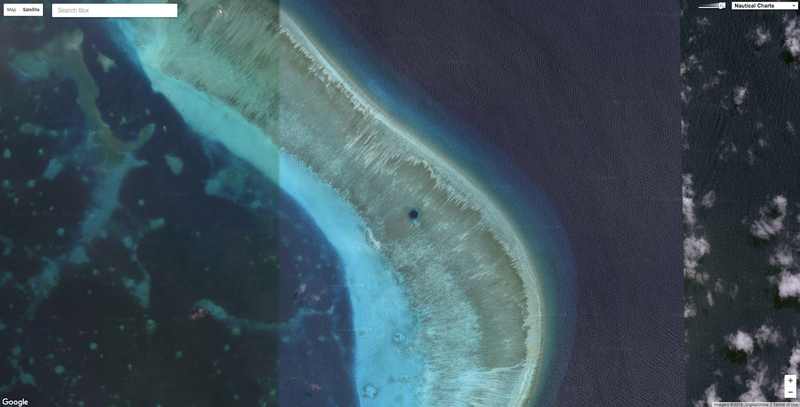 The almost vertical blue hole, located at 16°31'30" N / 111°46'05" E, measures 130 meters in diameter at the top entrance and 36 meters at the bottom, and is not connected with the ocean. 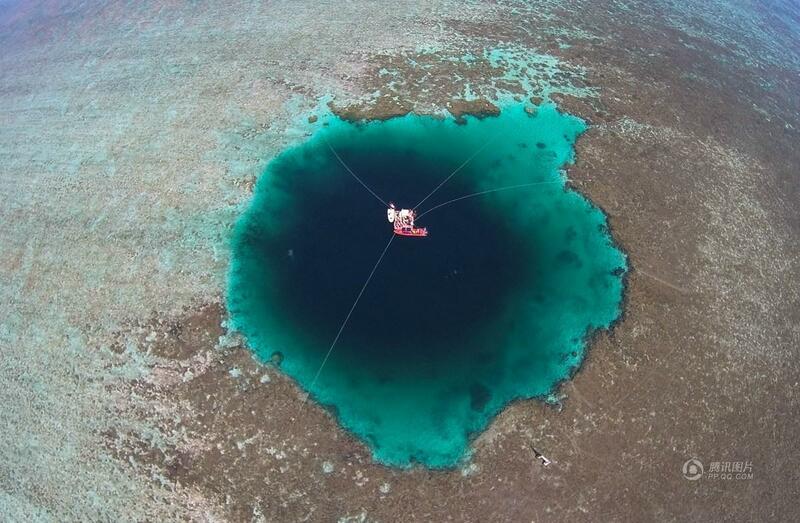 It’s said to be the deepest blue hole in the world. 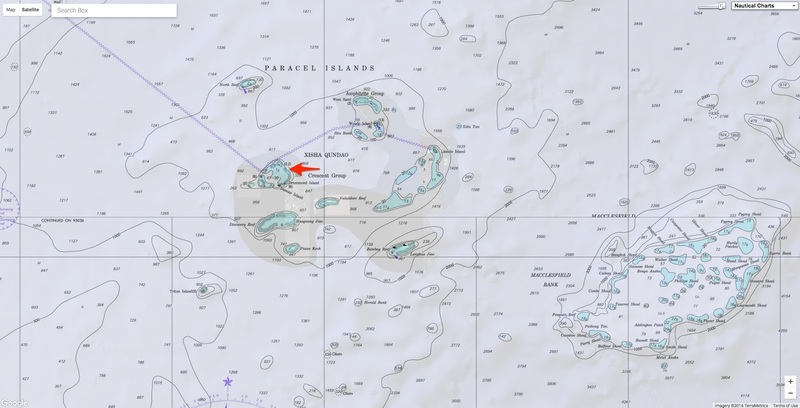 As local fishermen tell it, the deep blue “Dragon Hole” in the Paracel Islands, called the “eye” of the South China Sea, is where the Monkey King in “Journey to the West” acquired his famous golden cudgel. The mythical tale was published in the 16th century and is among the four great classical novels of Chinese literature. Last week, the Dragon Hole earned a new claim to fame. 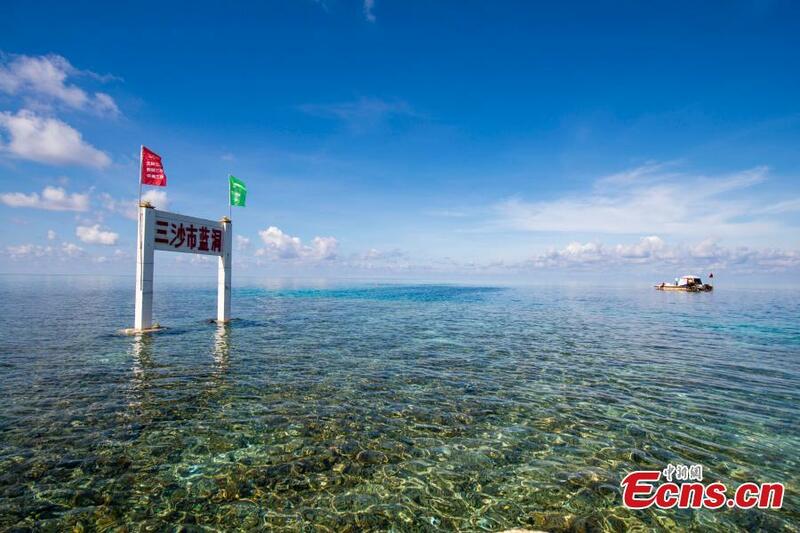 After nearly a year of exploration, Chinese researchers have determined that the underwater sinkhole is likely the world’s deepest, reaching about 987 feet below the surface and surpassing the previous record holder, Dean’s Blue Hole near the Bahamas, by more than 300 feet, Xinhua News Agency reported. The hole was found near the Paracel islans called as Xisha Islands by China. The islands are claimed by China, Vietnam and Taiwan. China has continued to assert its claim over all but most of the South China Sea even after this month's verdict by the international tribunal appointed by the Permanent Court of Arbitration which has struck down its claims of nine-dash line based on historic rights. Blue holes are named as such for their rich, dark blue coloring, a stark contrast to the otherwise aqua waters that surround them. Best described as underwater caves, these striking and beautiful formations open up with underwater entrances and extend below sea level, mirroring the appearance of a sinkhole. 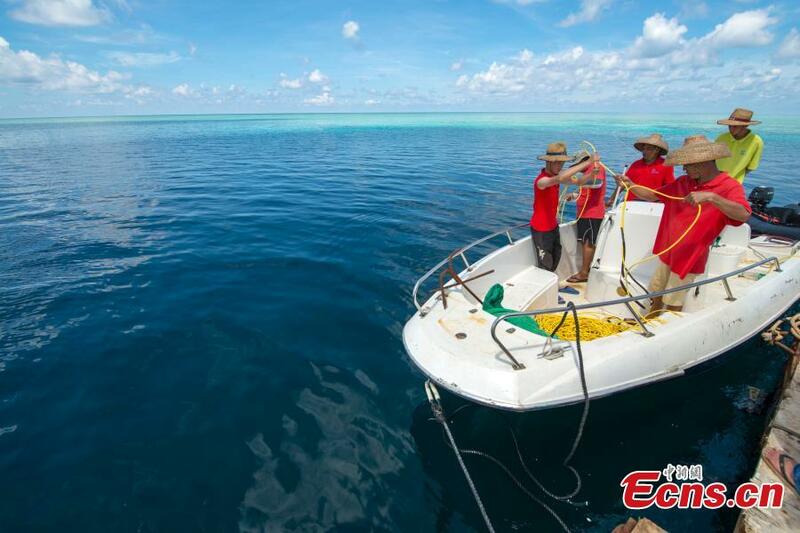 Researchers with the Sansha Ship Course Research Institute for Coral Protection began exploring Dragon Hole, known as Longdong, in August 2015 and completed the project last month, Xinhua reported. It measures about 426 feet wide and is almost deep enough to hold the entire Eiffel Tower. 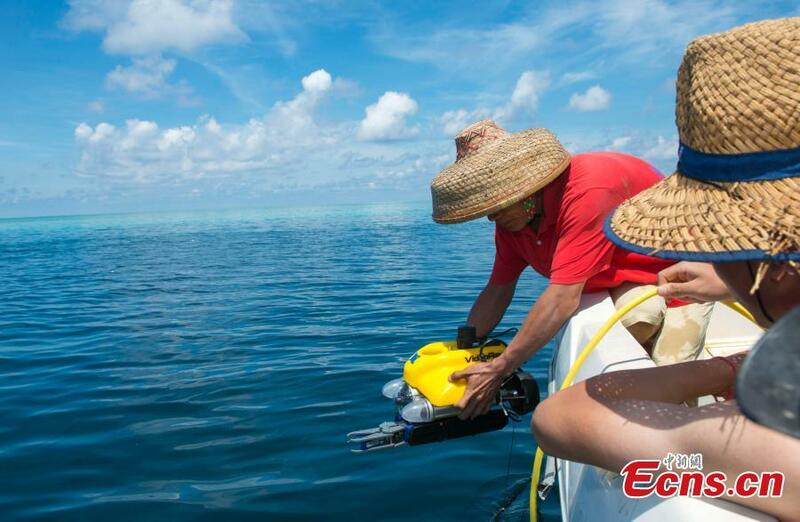 The research team used a Video Ray Pro 4 underwater robot to explore the sinkhole, reported CCTV News, where they discovered more than 20 species of fish and marine life near the surface of the vertical cave. Divers flock to the Great Blue Hole, surrounded by shallow, lagoon waters and a coral island. According to Atlas Obscura, this underwater cave was made famous by one particular diver, explorer Jacques Cousteau, who in 1971 declared the site one of the top 10 best places for diving in the world. Cousteau sailed on his ship, Calypso, to investigate the hole’s depths and discovered huge stalactites and stalagmites below the surface, Atlas Obscura reported. Cousteau also confirmed that the sinkhole had formed when a limestone cave formation collapsed after the glacial period. Dean’s Blue Hole, located near Long Island in the Bahamas, was previously considered the world’s deepest underwater sinkhole. Also a top location for divers, Dean’s Blue Hole has a diameter of about 82 to 115 feet on the surface, reports Atlas Obscura, but widens to about 330 feet as it deepens. According to the publication, water there is very clear with visibility as far as 115 feet down. Maximum depths in other blue holes scattered throughout the Bahamas and other parts of the world hover around 360 feet, but Dean’s Blue Hole extends far beyond at 663 feet deep. The newly discovered Dragon Hole is even more exceptional, reaching depths of almost 1,000 feet. GeoGarage blog : Just where exactly did China get the South China Sea nine-dash line from?